The global anticancer drugs market features a largely fragmented and highly competitive vendor landscape owing to the presence of some of the world’s leading pharmaceutical players and a constant rise in the number of small players focusing on innovative treatment methods, observes Transparency Market Research in a recent report. Leading players in the market compete with strong pipelines and innovative products that boast high efficiency and efficacy. Some of the leading players in the market are F. Hoffmann-La Roche Ltd, Eli Lilly and Company, Novartis AG, Pfizer Inc, Amgen Inc, Bayer AG, AstraZeneca, Takeda Pharmaceutical Company Limited, and Merck & Co., Inc. According to the report, global anticancer drugs market was valued at US$85.0 bn in 2016 and is projected to expand at a CAGR of about 6-7% from 2017 to 2025. If the projections hold true, the market could rise to a valuation of US$155.6 bn by 2025. In terms of drug type, the segment of targeted drugs held over 40% of the global anticancer drugs market in 2016. The segment is also expected to hold the dominant share of the global anticancer drugs market during the forecast period. Factors such as minimum side effects as compared to cytotoxic drugs, high specificity of the drugs, and effective results of these drugs are expected to drive the growth of the segment through 2025. Geographically, the market in North America dominated the global anticancer drugs market in 2016 and is projected to retain dominance over the forecast period as well, registering a CAGR of over 6% from 2017 to 2025. High healthcare expenditure from public and private sector for cancer treatment and the easy availability of drugs in this region is projected to contribute to the dominant position of North America in global anticancer drugs market over the forecast period. The mounting rate of incidence of cancer in the past few years is the key factor aiding the overall development of the global anticancer drugs market. The rate of incidence of several forms of cancer has significantly swelled across the globe in the past few years. With nearly 1 in 6 deaths across the globe caused due to cancer, the large group of diseases that come under the purview of cancer, affecting any part of the body, have witnessed massive attention from healthcare bodies and pharmaceutical companies in the past years. Owing to intensive research and development attempts made by a large number of pharmaceutical companies operating in the field, the pipeline of anticancer drugs has become strong and highly promising. This could also aid the expansion of the global anticancer drugs market over the next few years. 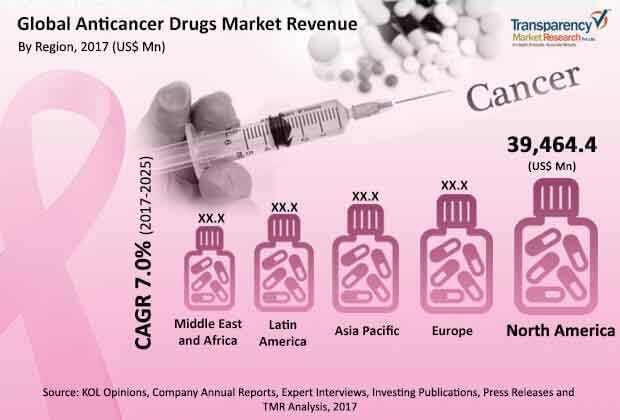 Moreover, increase in government funding, spur in cancer awareness programs, rising awareness regarding the need for early diagnosis and treatment of cancer, developed healthcare infrastructure are also expected to have a positive impact on the growth of global anticancer drugs market during the forecast period. Despite promising growth prospects, certain factors such as a glaring lack of awareness regarding cancer diagnosis and treatment across several emerging economies, high cost of advanced drugs, serious side effects of certain drugs, and unavailability of oncology drugs in some developing countries could restrict the growth of the global anticancer drugs market. Furthermore, cancer treatment stigma such as association with death could also negatively affect the growth of the anticancer drugs market in many regions.